Born August 18, 1989 Colorado native Alice McKennis always showed a passion for the outdoors and the mountains that surrounded her. Growing up near the small town of New Castle in western Colorado Alice began riding horses at a young age on the family ranch while also pursuing her first turns at age two at Sunlight Resort just outside Glenwood Springs. Skiing and horses dominated the young athlete's life as Alice and her older sister raced for various ski clubs in Colorado including Sunlight, Vail, Steamboat,Summit, Aspen and finally Rowmark Ski Academy in Salt Lake City, Utah. As Alice reached the FIS level of racing it was apparent that the decision would have to be made; horses or ski racing. Alice chose ski racing and set her sights on reaching the U.S. Ski Team to reach her ultimate dream of racing on the World Cup and in the Olympics. After being named to the U.S. Ski Team in 2008 Alice began racing on the World Cup in 2009 and started earning top ten results on the World Cup qualifying herself to compete at the 2010 Winter Olympic Games in Vancouver, Canada. Gaining the notice of coaches and competitors it was clear that the young racer had found her niche; racing World Cup Downhill. After a remarkable first season on the World Cup Alice suffered a knee injury in early 2011 fracturing her left tibia plateau. Not one to be deterred by a setback Alice made a full recovery and returned to racing the following winter. The next two seasons Alice continued to gain experience and more top ten results. The most impressive result of Alice's World Cup career so far came in 2013 by winning a World Cup Downhill in St. Anton, Austria. A dream and life goal realized for Alice and certainly a high point in Alice's ski career! Alice followed up the win in St. Anton by racing the World Championship Downhill in Schladming, Austria. Unfortunately that high point would be followed several weeks later by perhaps the lowest point in Alice's career. Alice suffered a devastating injury after crashing during competition in Garmisch-Partenkirchen, Germany. Alice shattered her right tibia plateau into more than 30 pieces while also fracturing her tibia. A surgery that required a plate and eleven screws to piece back together Alice's shattered knee left her future as a ski racer uncertain. As the healing began Alice still kept her sights on the 2014 Winter Olympics in Sochi, Russia. Alice worked tirelessly to try to return to snow in time to earn a berth on the Olympic team, but it was not to be. The injury was simply too severe to make a full recovery in less than a year and after only a few weeks on snow prior to the Olympic games Alice called her racing season off in order to have another surgery to remove the plate and screws from her leg and shifted her focus to seasons ahead. Returning to competition in 2015 Alice continued to build strength and confidence finishing the season with a World Rank of 23rd in Downhill. Alice capped off her season by winning the US National Super-G Championships, earning her first national title. In the 2017/2018 season Alice again showed some her potential as one of the top World Cup ski racers by finishing fifth in the Olympic Downhill in Pyeongchang and placing third in the final World Cup Downhill of the season in Are, Sweden. Finishing the season ranked 12th in the world in Downhill has put Alice in solid standings leading into the 2019 World Championships in Are, Sweden. 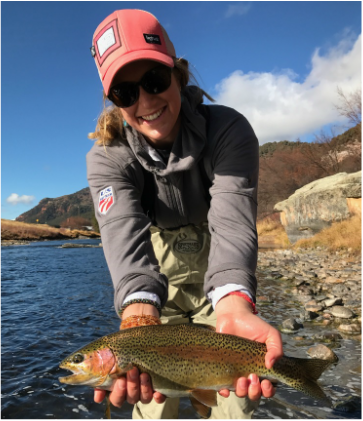 Outside of skiing Alice enjoys fly fishing, rafting the rivers of the west including the Colorado and Green rivers, mountain biking, hiking, camping or any activity that takes her outdoors. Alice is perusing a Bachelors Degree in Business from Devry University. Alice splits her off time between her home state of Colorado and Park City, Utah.